Hedges seem to have the same excitement rating as might bathroom tiles – you’ll probably live with what you have got – but there is an undiscovered wealth to hedges and their versatility is endless. They will enhance your life! Hedges do define boundaries – they are the human equivalent to a dog marking it’s territory and many people then leave it at that and settle for their square plot. But a hedge can then subdivide, it can bend, make circles, triangles, cubes, arches shrubberies, feed the birds, keep the wind out and the warmth in and on and on. Let the hedge migrate into your garden and you will find structure, vistas, surprises, getaways and pleasure. 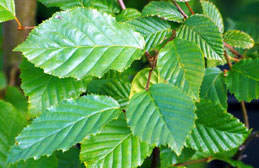 Define and protect your new veggie garden with a beech or hornbeam hedge (pictured right). Have a wildlife garden with a mix of hawthorn, spindle, guelder rose, dogwoods, enjoy the autumn colours and many coloured fruits – the wildlife will be rampant. Your children will safely clamber their way through a maze of laurel, box, and privet and discover a safari in their back garden. Embark on a topiary structure with some yew. 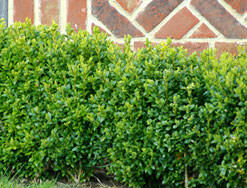 Screen an eyesore and feed the birds with holly – or debunk the leylandii myth and try that. A velvety scented curve of thuja, a nutty hazel walk – all technically hedging! Privacy is deeply sought after in any dwelling hence the tendency to evergreens for boundaries. Many people would rate privet as our ‘national hedge’ – though not a native to the UK it is native to countless front and back gardens. With its evergreen properties, white blossom and black fruits it ticks many boxes. Laurels can be clipped to a neat ‘wall’ or if you have the space let it ramble. 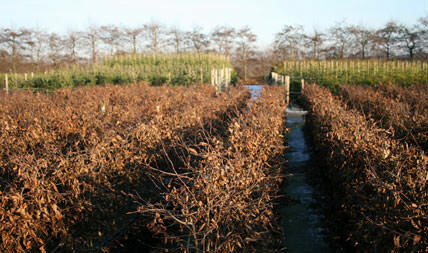 Hornbeam and beech hedges retain their leaves through the winter so fall into a semi-evergreen category. Holm oak will create a great structural, impervious hedge or feature within a garden. Yew is ever popular as a backdrop to borders and versatile for topiary, arches etc. Our hedges are the right size for you to enjoy watching them grow for two years to get to their desired height – with most varieties. Going for bigger instant plants can work but requires some skill to get well established. We say go for the mid size or the small at planting and your satisfaction is guaranteed.